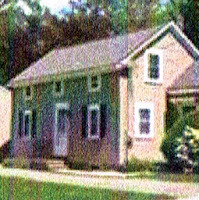 This small house, built about 1825, was one of several built on a country road across from a factory. Today a park has replaced the factory. The house is in-town. Over the years wings have been added on 3 sides. I have cropped the photograph in order to focus on the original house. The post and beam frame includes recycled beams. 2 have beaded edges - probably recycled from the best room of a pre-1760 house. 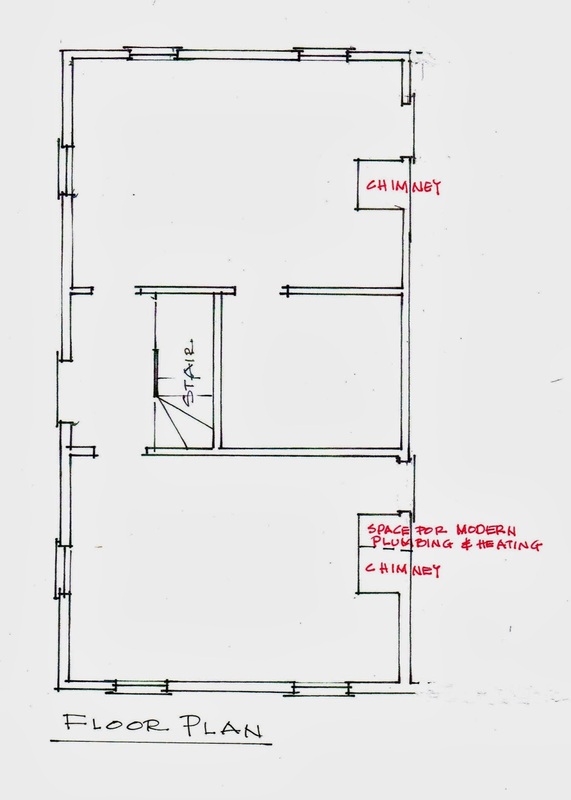 Here is its section - a slice through the house showing its basic layout. Here is the 3-4-5 triangle used to locate the 2nd floor joists and the ceiling joists. 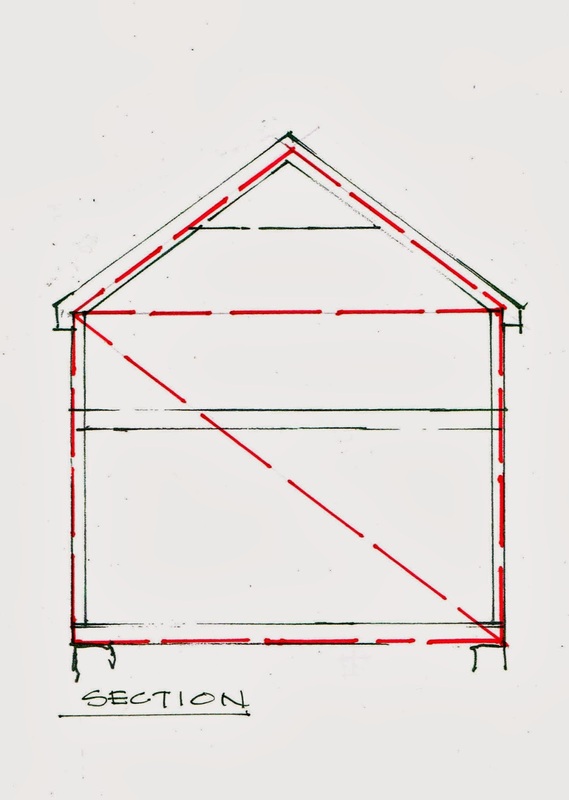 vertical leg crosses the first triangle at the location of the second floor. The second floor window locations are also set by this line. 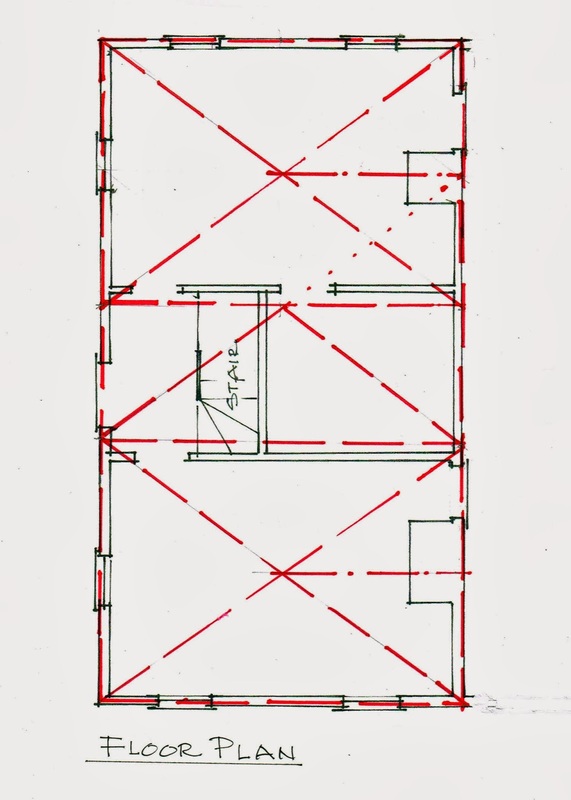 All this also makes me think that the house frame was laid out in the traditional way, on a flat space called a framing yard and then dismantled and re-erected on site. 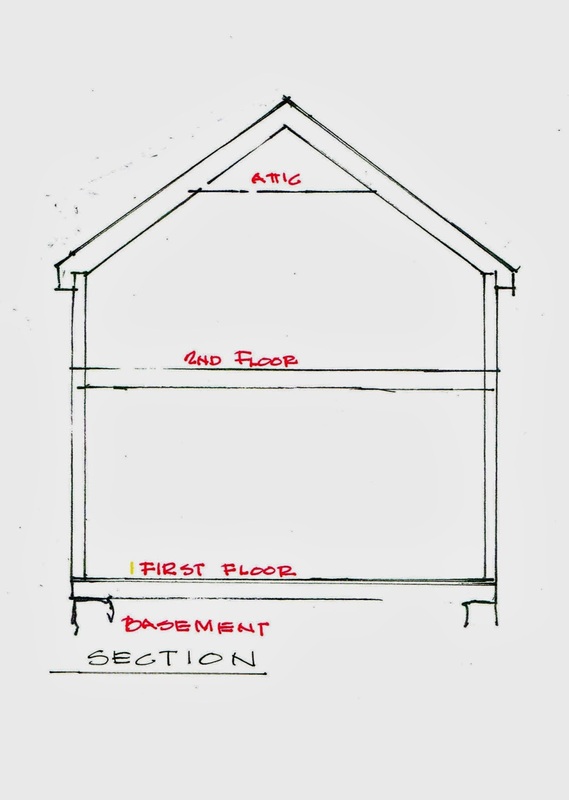 Contractors lay out rafters in this same way today as they frame a roof. They use the floor of the house just below the roof as their framing yard. Here is the floor plan. I've noted the chimneys. The lathe and plaster box around the lower one includes modern plumbing, heating and electrical systems. 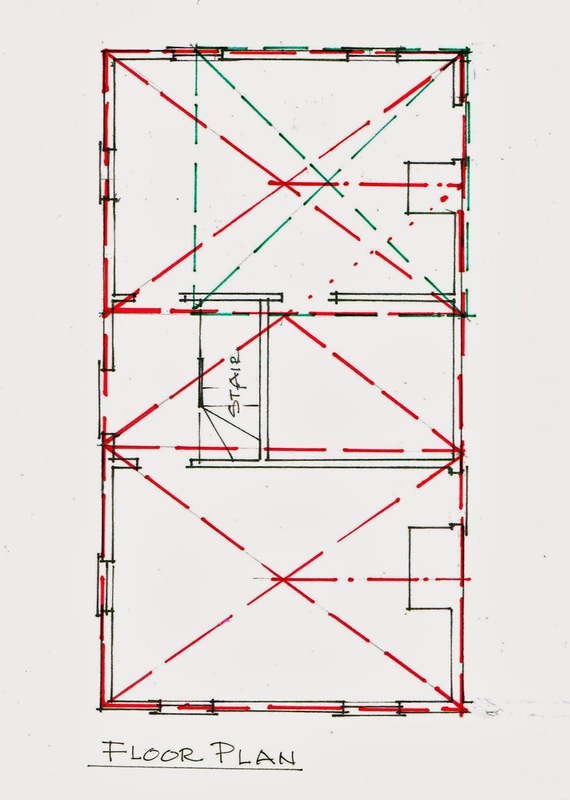 And here is how the 3-4-5 triangle was used to layout the floor plan. 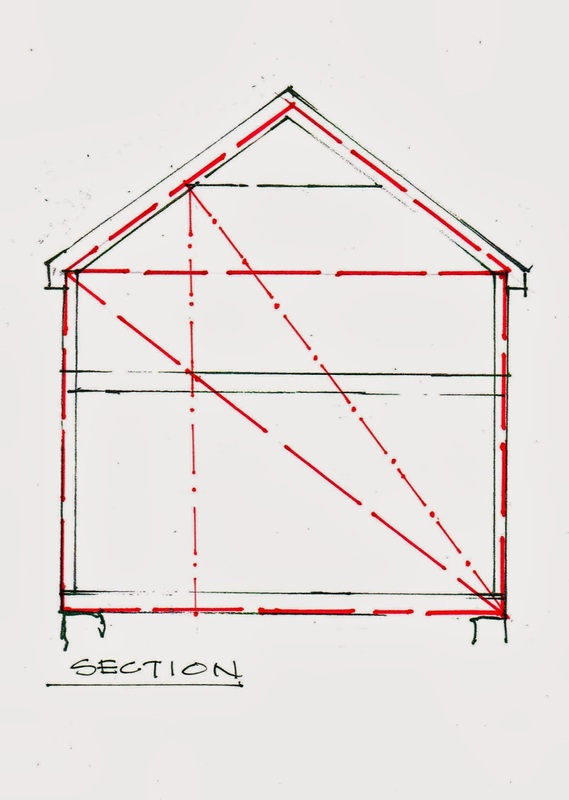 Just as the exterior sills and walls were placed inside the box determined by the triangle, so the beams on either side of the stair were placed inside the box. The walls, set above the beams, are on the inside edge. The chimney locations are set by the triangle, but the windows on the opposite wall are not. They are centered on the rooms. The windows on the side walls are located by a square - in green - based on the shortest leg of the triangle. I thought you would enjoy this aspect of "Wrighting" barns and houses. The 3-4-5 was a big part of that. What I would add is that after further study and observations over the years, I don't believe it is that far removed from the same principles of the "golden section" in as such they are very related in proportions. I discovered this many years ago after having spent more time with the Amish Barn wrights I studied under pointed out the importance of the Pentagram in there traditions and it's ramifications in the "Lords Creation." Now I am a spiritual person by culture but not a Christine, which they excepted as one of "God's Mysteries." What I went on to discover is all of the proportion of nature, including the "golden section", the "3-4-5" triangle and several others all reside inside the Pentagram, which of course is a powerful tool in ancient architecture. They, and my grandmother, felt that is why much of modern architecture does not have any soul, as these proportions have been lost in their design and layout. The fire place is a peculiar missing link, but they may have had a shepards stove of similar burn unit in stuch a small frame instead of a fireplace which would also suppor your ascertion that this was a "bunk house" for working folk. I would also point out that the 3-4-5 is very ancient gong back thousands of years so I'm not sure it is a good indicator of age, as it has been used in many of the buildings I find from earlier times. I always enjoy your comments. Thanks. I have measured over 1000 old houses in the area where this house is located. With one or two exceptions, fireplaces are what is used even after Franklin and cast iron stoves become common. No shepherd stoves. This may be because the ethnicity is English, with a little Scotch-Irish mixed in, ie, no major influence from the Continent until the Industrial Revolution.